Ahh, Christmas is over! Not to say I'm relieved, but considering I decided to give handmade gifts to two nieces and a great nephew the week before Christmas I am definitely relieved that they were finished in the nick of time. Yeah, I know I should have come up with this brilliant idea months ago, but I didn't. Niece #1 - Miranda, is totally into Chris Daughtry or in her words "Holy cheesy bananas he is so cute". She now has 3 "husbands" but he's her favorite. Ahh, to be 14! So for Ms. Bananas, I decided to make a tote bag with Daughtry pictures and peace signs, which she is also totally into. I bought the canvas bag since I didn't have much time, bought a packet of iron-on peace signs and purple hearts from JoAnn's, and downloaded images of Daughtry from the net which I printed on fabric printer paper. The construction went pretty well. The images were adhered with heavy duty webbing. This was the "best gift ever" and she went totally cheesy bananas over it! Niece #2 - Stepanie, has gotten into knitting and has dabbled a bit with crochet. She claims knitting to be way easier than crochet. Anyway, I showed her the pop tab purse and she absolutely loved it. I tried showing her how to crochet the tabs together, but she doesn't fully understand crochet yet. Yes, every time I see her I give her lessons on something; it's cool. So for her I made a small pop tab purse with a zipper closure and a heart pattern for the inner lining. I used 566 tabs and probably about 250 yards of nylon. It turned out cute and I got to practice making the bottom/side attachment better. She also said it was the best gift she's gotten! Saturday, I took her an old sewing machine of mine and she learned how to thread it and we made a pillow together. Now we have to make one for Miranda with Daughtry on it (of course). Great nephew - He is almost two and I've been admiring all the cute stuffed animal patterns on Lion Brands site. 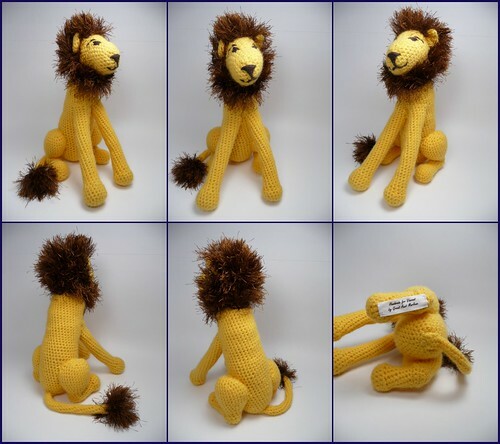 So I decided to make the "Leo the Lion" stuffed animal for him. I don't crochet and was pretty much lost on the first line of the directions. Fortunately someone on the net explained what crocheting into the free loops meant and I was on my way to making my first crochet stuffed animal. It turned out very cute! I haven't seen him yet to give it to him and honestly might not even be there when it's gifted on my behalf. It was very cute though and I'm sure he'll like it. Next year I promise not to procrastinate!